At last! 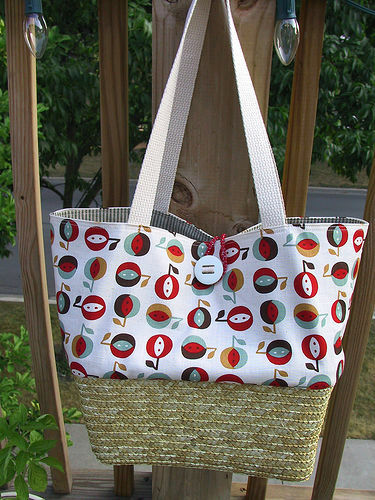 If I ever say to you, hey let me make you a basket bag. Don’t get too excited because it very well may take me over 2 months to make it. Sorry Amy! I think finally your long overdue package is ready to be sent out. See everyone on my ‘long overdue’ list — there is hope for you yet! Hey, I recognize that apple fabric. 😉 I got some for myselt, too, just waiting for a great idea. Cute bag! jen, I was good and actually shared. the postal clerk might have to wrench it out of my hands though! That’s some of the best fabric I’ve seen in a long time…Amy’s a luckky gal. Beautiful work too, by the way. oooh, i like the apple basket bag! wonderful work hillary, amy will look very stylish with that bag on her shoulder! Beautiful!! It’s been fun watching your basket bags progress! You have them down to a science!! I love the bag, and I have to compliment you on the way you attached that button. It reeks of “attention to detail”. So much talent. I also have to say that I love your sight redesign! Thanks for being so inspiring! 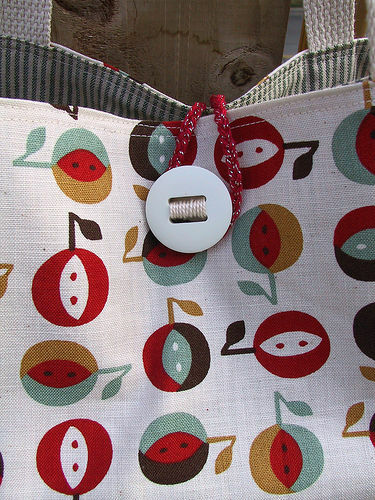 Beautiful bag and that matress-ticking style lining works perfectly with the apple fabric (which is to die for – where did that fabric come from?!? )… Debbie is right on – you’ve got these basket bags down! Oh wow, I really love that!!! oh, so nice! that settles it, i am booking a flight to japan tomorrow! daggone, but that is my favorite bag OF ALL TIME!!! well worth the wait! I would say that this is more than well worth the wait. Ho ho ho How I love this fabric! okay-I actutally *gasped* out loud when I saw this and then to read it was for me! the babies thought I was fraking out! (I was!!) pete had to stop working and come to the computer and the whole family stood aorund oohing & ahhing! so, what can I say? ?-I love it sooo much. thak you, hillary.I really can’t believe that I have a bag made from this beautiful fabric-and your workmanship is stunning. can’t wait to get my grubby mits on it. you are too good to me. Wow, what a lovely gift. I adore the button on the bag. Where ever did you find it? As normal your work is so cute I can not stand it. Oh, that fabric is just YUMMY!!!! Another beautiful basket bag…lovely! that fabric is to die for! That fabric is gorgeous! Thanks for the link too!!! that apple fabric is soo super nice..
Looks great! I love that fabric. Better late than never, right? It’s great to see so much creativity! This bags a stunner! Well, to add to all the praise above, this is a fabulous bag. Amy is very lucky!! How o how do you attatch the fabric to the basket,and where do yo find those devinly simple baskets to attatch it to?! Your site is always so delightful, enjoyable and enchanting. I’m just blown away by your eye for detail. Thanks for all of the inspiration! what a cute idea. and that fabric is just plain adorable. Oh my goodness I am in love with that bag and the fabric! Wow! 🙂 thanks for all the comments. can’t really go wrong with that beautiful fabric! ugh i love that fabric to pieces. the cutest summer bag EVER. how did you get it outside of japan? i did a goodle translate search of their website but it was stilly pretty broken up. if you could let me know that’d be awesome. i must have their alligator fabric! Great apple basket bag! So, the tutorial applies and you just changed it to apply to the the different shape of your basket from Pier 1? And, the basket was oval to start with? Very clever! I love it! Do you use heavier thread? What makes it secure enough to hold any weight? Thanks for your time.